Set overlooking a stunning view of a truly spectacular valley, the gorgeous contemporary styling makes this one of the most attractive lodges in South Africa! In the heat of summer, take a dip in the crystal clear waters of one of the natural rock pools you can encounter as you explore the spectacular gorges on foot! 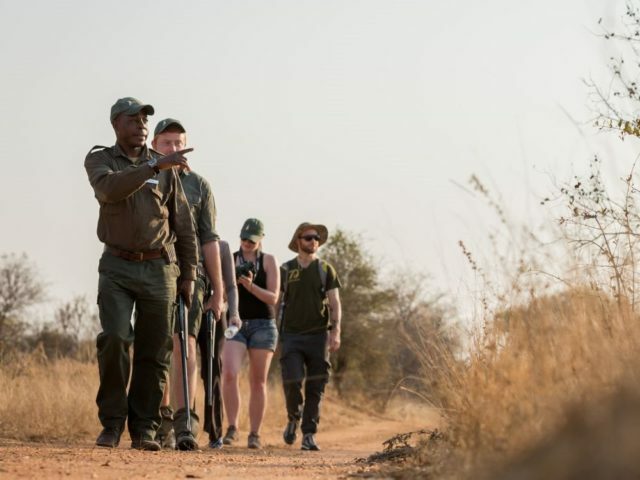 Walking trails (extra cost) give you the opportunity to really experience the bush close-up and personal – and the highly qualified trail guides and stunningly scenic countryside through which you walk make for an utterly unforgettable and rewarding experience! light absolutely pours into the suites, with expansive floor-to-ceiling sliding windows giving an unhindered view of the amazing Waterfall Valley beyond! 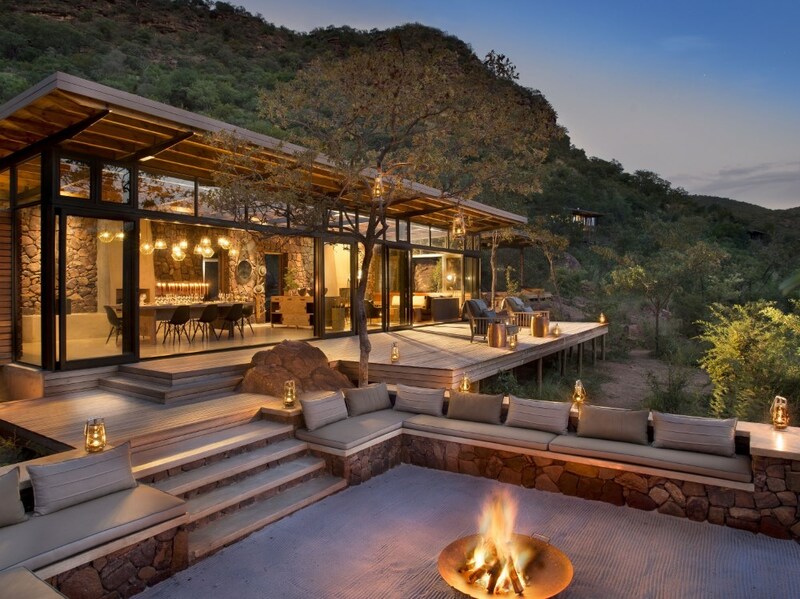 There are just a handful of game lodges in South Africa where the view can be described as being truly spectacular and the gorgeous new Marataba Mountain Lodge is certainly one of them! 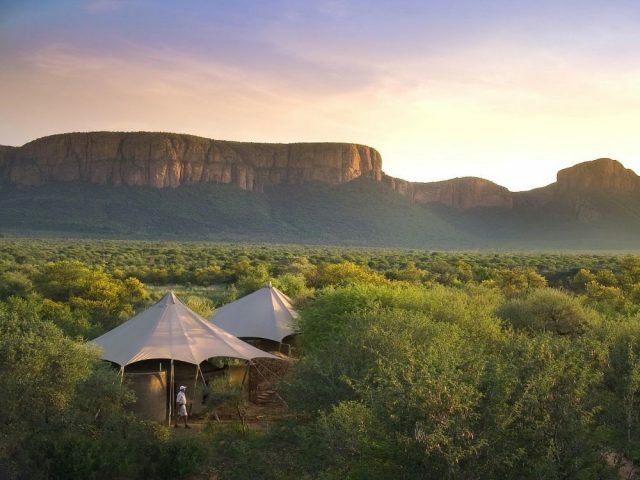 Previously specializing in walking safaris (when it was known as Marataba Trails) the lodge has now been repositioned as a conventional safari lodge product (ie 2 game drives offered daily) a change which promises to bring its undoubted charms to a much larger potential market. Marataba Mountain Lodge stands out by offering both the most luxurious and gorgeous accommodation as well as offering up some of the most beautiful landscapes in the country! The lodge is set on a hillside with truly stunning 180-degree views into Waterfall Valley, an isolated and scenically superb section of the Marakele National Park. Whilst the first thing that’s likely to catch your eye are the gorgeous views, we can’t help also getting excited about the actual lodge itself which is also one of the most attractive in the country! The rooms and public areas alike have clean modern and contemporary lines, a bit of a Scandi-meets-safari type design feel. Of course, the danger inherent in being so minimalist is that it can all end up a bit cold and sterile, yet Marataba Mountain Lodge has cleverly avoided this through the extensive use of natural elements like gorgeous wood and natural stone walls which has softened and warmed the entire feel. Perhaps most strikingly of all, everything is set up to maximise the truly amazing views over the valley below. Wood and light are the key elements of the 5 luxury suites at Marataba Trails: beautiful open-grain wooden finishes and flooring is perfectly complemented by shades of charcoal and white and light absolutely pours into the suites, with wide glass windows and floor-to-ceiling doors giving an unhindered view of the amazing Waterfall Valley beyond. And whilst the gorgeous rooms are officially called “Eco-Suites” on account of the fact that the lodge is totally driven by solar-power, don’t for one moment think that means that they scrimp on any of the necessary comforts – on the contrary, with features like air-conditioning, a wood-burning fireplace, en-suite rain shower, Nespresso machine and even USB charging port, guests are assured of a luxuriously comfortable as well as scenic stay! The lodge’s main public area is similarly stylish, with floor to ceiling sliding glass doors opening up the open-plan lounge and dining area to the stunning views beyond. Just below the lounge area lies one of our favourite features of the lodge – a gorgeous firepit seating area perfect for chatting with your fellow guests under the stars about the adventures of the day! Then around the corner (just far enough for privacy, but still close enough for some friendly drinks service!) is the lodge’s infinity swimming pool – the ideal spot to while away the heat of the summer hours between game drives with an ice-cold drink in your hand whilst simultaneously drinking in the sumptuous views! As mentioned previously, this lodge was originally launched as specializing in walking trails – the good news is that you are now offered in effect the best of both worlds: for guests wanting to enjoy the conventional 2 game drives a day safari recipe, Marataba Mountain Lodge now offers this; however, if you’re still keen on enjoying a walking safari through some of the most spectacular scenery in any of the South African reserves, this is now offered as an extra cost alternative to the morning game drive (by the way, these walking trails are also now offered from Marataba Safari Lodge too) With rivers flowing through gorges and grassy plains framed by imposing mountains, these walking trails are an experience to be savoured with the walks taking place in the morning when temperatures are cooler and energy levels higher - after heading back for breakfast and the chance to chill around the lodge (the sparkling swimming pool will no doubt prove particularly enticing in the warmer summer months! ), you then head out in the afternoon on a game drive or perhaps even a boat trip on the lake! 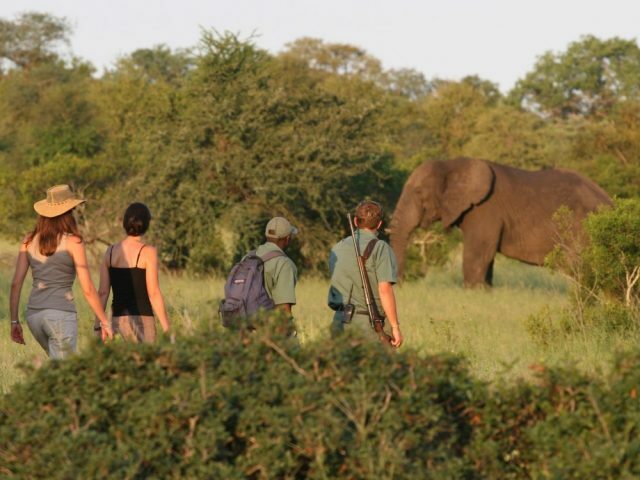 Africa on Foot is all about experiencing the excitement of walking safaris - and let’s face it, little compares to the thrill of meeting the Big 5 on foot!